The War on Drugs is a bad idea. Not because people should be using drugs, but rather because the societal harm of prohibition is much greater than the societal harm of legalization. Moreover, even though I personally disapprove of drug use, I adhere to the libertarian principle that people should be free to do what they want (even stupid things) with their own bodies. Today, though, let’s focus on the practical argument and look at some fascinating academic research from Evelina Gavrilova, Takuma Kamada, and Floris Zoutman (two economists and a criminologist). Here’s a summary from the abstract of their study. We examine the eﬀects of medical marijuana laws (MMLs) on crime. …Using data from the Uniform Crime Reports, we show that the introduction of MMLs lead to a decrease of 12.5 percent in violent crime, such as homicides, aggravated assaults and robberies in states that border Mexico. We also show that the reduction in violent crimes is strongest for counties close to the border (less than 350km)… Analysis from the Supplementary Homicide Reports data reveals that the decrease in homicides can largely be attributed to a drop in drug-law related homicides. We ﬁnd evidence for spillover eﬀects. When an inland state passes a MML, this results in a decrease in crime in the nearest border state. Our results are consistent with the theory that the introduction of MMLs reduces activity by Mexican drug traﬃcking organizations and their aﬃliated gangs in the border region. MMLs expose drug traﬃcking organizations (DTOs) to legitimate competition, and substantially reduce their proﬁts in one of their most lucrative drug markets. This leads to a decrease in drug related crime in the Mexican border area. Our results indicate that decriminalization of the production and distribution of drugs may lead to a reduction in violence in markets where organized drug criminals meet licit competition. In other words, legalize drugs and you get less violent crime. And for those who want some of the underlying economic analysis, here’s the relevant section of the study. 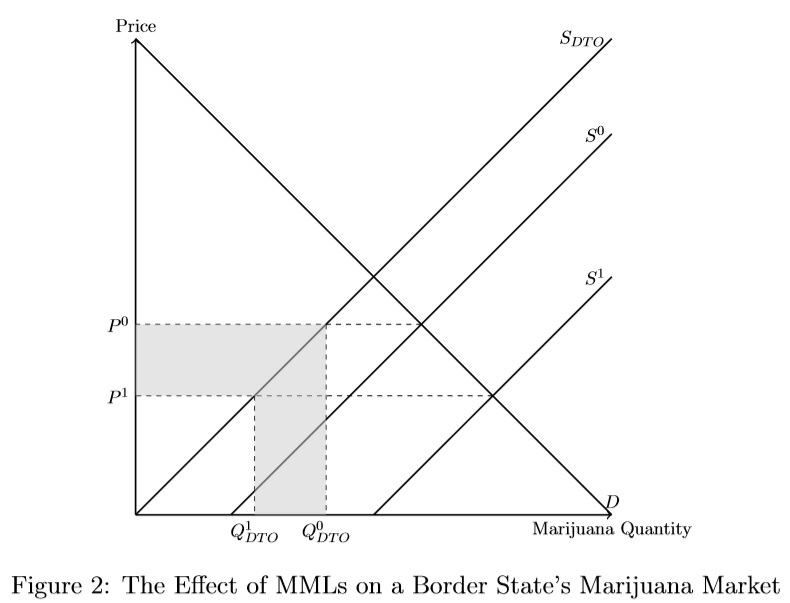 Figure 2 represents the market for marijuana. For simplicity we assume that illicit and medical marijuana are perfect substitutes in consumption, such that the supply and demand of both substances can be represented in a single ﬁgure. SDTO represents the supply curve for marijuana by DTOs. S0 represents the combined supply of marijuana by DTOs and local farmers that were already active prior to the introduction of a MML. A MML allows for entry of additional local farmers and thus shifts the combined supply to the right to S1. This results in a reduction in the price of the drug, an increase in the overall quantity, and a reduction in the quantity sold by DTOs. The shaded area in the graph depicts the aggregate loss in revenues for DTOs. Here’s the graph that shows how legalization creates significant losses for drug smugglers. The shaded area may seem somewhat akin to the deadweight loss caused by taxation, but keep in mind that the losses to drug dealers are a plus to society while the economic losses from bad tax policy are a minus for society. Now let’s shift from economics to bureaucracy with a story that captures the Drug War mindset (h/t: Reason). If Illinois legalizes marijuana for recreational use, law enforcement officials fear job losses for hundreds of officers — specifically, the four-legged kind. …There are about 275 certified narcotic detection K-9s in Illinois… Because many K-9s are trained not to be social so their work won’t be affected, Larner said a number of dogs would likely have to be euthanized. Yes, you read correctly. Defenders of the War on Drugs are threatening that they will kill their dogs if pot is legalized. Needless to say, this is a perverse version of the Washington Monument Ploy. Quite similar to what happened several years ago in Massachusetts. Let’s close with a clever – but quite accurate – look at how the current system operates. 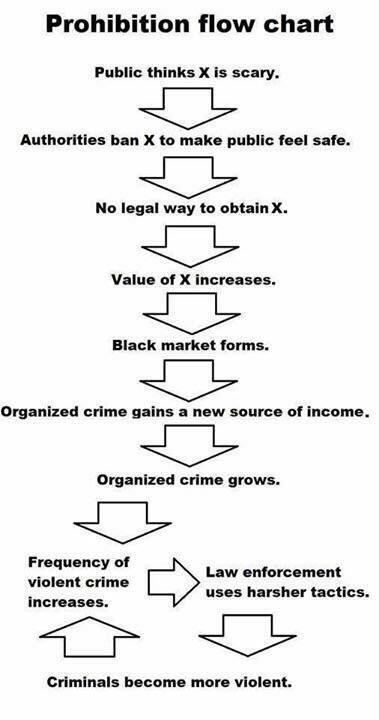 I especially like the part at the bottom, which shows the cycle that creates more violence, though it also should have shown ever-higher profits for drug dealers. The good news is that we’re winning on this issue. More and more states are liberalizing and we’re gaining more and more allies (libertarians such as John Stossel and Gary Johnson, but also traditional skeptics such as Pat Robertson, Cory Booker, Mona Charen, John McCain, and Richard Branson). P.S. The one downside to legalization is that politicians get a new source of tax revenue. And the majority of those dogs are really “trained” to react to what the handler does. Nothing to do with any drugs, except maybe the border dogs. This is why there are so many lawsuits of illegal searches. 275 certified narcotic dogs,,,, dang,, that’s a lot of dogs.. So subsidize the redundant dogs. Simple, isn’t it.